When it comes to finding the best affiliate pr ograms for bloggers, identifying programs that are reliable and pay well can be a real challenge. Which one should you join when you don’t know what to look for? That’s an important question to answer because most affiliate programs will make you very little money or nothing at all. Then there are a few that would probably make up the bulk of your affiliate commissions. So in today’s post, I’ll help you find the best affiliate programs that will make you money no matter what niche or topics you write about. To make money from affiliate programs, having a website or a blog is very much a necessity (in most cases anyway). Also, you can learn how to make money blogging and affiliate marketing here: Learn How to Make Money Blogging (Detailed Guide For Beginners). Do you just write some content and then sprinkle a few affiliate links, and sit back and wait for the big money to roll in? To generate any meaningful income from affiliate programs, you’ll need traffic and tons of it. For a start, you’ll need hundreds of visitors or more per day, the more the better of course. But that’s only part of the equation. What you really need is targeted traffic. I’ve made tens of thousands of dollars from CJ.com alone because I received highly targeted search engine traffic to my affiliate websites. Best of all, once the ball starts rolling, everything will run on autopilot. You will continue to generate passive income day in, day-out without doing much work as long as you get targeted traffic and your content stay relevant. I’ll write more about making money from affiliate programs in my future posts, so stay tuned! Only join and promote affiliate programs that fit with your niche. For example, trying to sell a forex trading software to people interested in gardening will result in little to no conversion. The kind of traffic coming to your website will also determine the type of products/services you can promote. In affiliate marketing, a cookie is a small file placed in web browsers to track sales or referrals. Some cookies last for 24 hours while others could last 30 days or longer. If a user clicks your affiliate link any time within the cookie duration and makes a purchase, you will get a credit. The longer the cookie duration, the better because you will still get paid even if the user takes longer than normal before making a purchase. If you’re joining an affiliate program that’s managed in-house by the merchant themselves, perform some research to make sure that the company is reputable and is actually paying their affiliates. If in doubt, it’s better to join larger affiliate networks because all the trackings and payments are done by the network. Often, the network will still pay you even if the network itself is not paid by the merchant. Do the merchants offer creatives to help you promote their offers? This will make it easier for affiliates to market more successfully. Personally, I prefer using just links and writing my own copy because they convert much better than banner ads. Having the option to link directly to specific products will make your affiliate marketing effort more effective. This is especially important if the merchant offers lots of products to promote. Each affiliate program has specific requirements on how you should promote their products/services. For example, some don’t allow you to use Google Ads to promote their products or offer rebates or promised kickbacks from your affiliate commission as an incentive. Understand the do’s and don’ts when applying for an affiliate program or risk having your account suspended. EPC stands for earnings per hundreds clicks. This metric is used by many affiliate networks such as CJ.com and ShareASale as a way to gauge how well a merchant’s affiliate program is converting for their affiliates. For example, suppose you are getting 200 visitors per day to a page in your blog. If only half of the visitors end up clicking your affiliate link, that’s still 100 clicks per day. If you send those 100 clicks to an offer which has a $20 EPC, you could potentially earn $20 per day. In a month, that’s $600 just by promoting one offer. That said, the EPC number is just an average, you could earn more or less. In general, you would want to promote programs with a high EPC. While it’s totally fine to promote physical products, if you have an option to promote digital products more, do it. Because digital products usually have much higher commision rates than the physical ones. Try to find affiliate programs which offer recurring commissions. This means you will continue to get paid as long as a referral remains a customer. WordPress themes like ThriveTheme and landing page creator like ClickFunnels are some of the high-paying affiliate programs you can consider. For instance, ClickFunnels offer 40% recurring commission, plus 5% second-tier commission from each sale that your referred affiliates make. The followings are some of the best affiliate programs for bloggers in various niches that you can join right now. How many programs should you join? If you are just learning about affiliate marketing, I’d recommend picking two or three to test the waters. As you gain more experience or looking for more specific products to promote, you can apply for more programs. I’ll try to summarize what each affiliate program is about, the benefits for joining, along with the commission rates and other details that you may need be aware of. If you are new to affiliate marketing, you may have come across terms like pay-per-sale, pay-per-lead and pay-per-click. Pay-per-lead means you get paid when someone gave their email or other contact info to the merchant. Pay-per-sale means you get paid when someone actually purchase something via your links. An affiliate network is like a marketplace where you can find merchants in various categories and participate in their affiliate programs all in one convenient place. Whatever your niche is, joining affiliate networks should be on your to-do list if you want to make money blogging. Now let’s go through the list of affiliate programs for bloggers (in no particular order). ShareASale has been in business for over 18 years and it’s one of the most reliable and established affiliate networks. After the acquisition by Awin, a global affiliate network, ShareASale has started including more international affiliate programs which mean more monetization opportunities for bloggers. In term of payment, the minimum payout is $50 via direct deposit, mailed check, wire deposit and Payoneer. Payoneer is a great choice for those not residing in the US because they can get their payouts faster. ShareASale has more than 40 categories to choose from. These include art/music/photography, health & fitness, fashion, financial, food/drink, home & garden and more. So you should be able to find relevant affiliate programs no matter what niche you are in. You can also refer affiliates and merchants to their program. For each merchant signed up through your links, you’ll get $150 and $1 for each qualified affiliate. This affiliate must sign up with ShareASale as an affiliate, and generate at least one click in order for you to receive the $1.00. Grammarly – automated proofreader, spelling and grammar checker. PicMonkey – graphic design templates, Pinterest pins, photo editing and more. ShareASale affiliate – you can promote ShareASale on your blog too! I joined ShareASale since 2004 and find them OK. Some gripes I heard from other affiliates include the somewhat outdated user interface, and problem contacting merchants directly. CJ short for Commision Junction is one of the largest and most established affiliate networks around. They have more merchants than any other affiliate network. I’ve been a member for a while and never have encountered any issues with them. With CJ.com, the minimum payout is USD100 via check, direct deposit or Payoneer. You can even select to get paid in your own currency (if supported). This list wouldn’t be complete without the Amazon.com affiliate program. It’s one of the most popular affiliate programs for both new and seasoned bloggers due to the mind blogging products selection. Because of that, you can simply choose a target keyword, write your article around that keyword and then later find relevant products to promote and sprinkle the links within your content. Most product categories have pretty low commission rates between 1%-10%. The short 24 hours cookie duration is also a bit of a bummer. If a user clicked your link and only complete the purchase 24 hours later, you will not get the credit. That said, Amazon.com is pretty good at converting people to make a purchase. They’re a trusted household name after all. If the visitors end up buying more items from the other categories, you will be credited for all their purchases. Another thing you should be aware of is that Amazon.com requires you to make at least one sale within 90 days of sign-up or else they’ll reject you from the program automatically. The good news is you can always reapply later. Although, you’ll have to update all your links. Also, you’ll probably make more money if the bulk of your visitors come from the US. If you want to override the country restriction, you can try tools like GeniusLink to earn commission through purchases made by international traffic. You will need an Amazon Associates account in each country for which you want to monetize the traffic. It will cost $5 per 2000 clicks so it’s up to you to decide if it’s worth using. Short for Affiliate Window, it’s a medium size affiliate network company based in Europe so it is a great choice for EU-based publishers. In addition, you can also find many US companies like Hyatt and BuzzFeed. If you are in finance, shopping, telco and travel niche, Awin is worth joining. To ensure only serious affiliates apply for their program, they charge a $5 admission fee which you’ll get back with your first payout. The Awin Publisher Referral Programs encourages you to refer new affiliates. 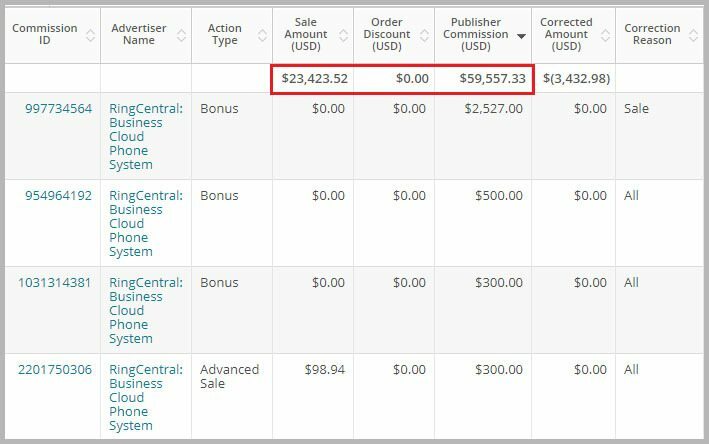 When an affiliate you referred receive their first commission payment, you will earn $30. Once you got accepted to individual programs, you can install their WordPress plugin that automatically transforms all your links into affiliate links. Flex Offers offers many established US brands like Ticketmaster, Yahoo Small Business and Macy as well as more European companies and others from around the globe. They have over 20 million products on offer in a wide range of markets, so it’s a good network to join (besides Amazon) if you looking to sell physical products. As part of their verification process, all initial payments are sent via check. The check must clear before you can setup direct deposit for future payments. Another cool thing about Flex Offers – you can also refer other publishers and then get a percentage of their commissions. Their FlexRev-$hare referral program based on your monthly sales volume. In essence, the more money you make, the more you will earn on your referrals (up to 50%). MaxBounty is a little bit different from the other affiliate networks in that most of their offers are of the CPA types. CPA stands for cost per action. That is, you get paid when a user takes a specific action such signing up for a trial, taking a survey, getting a quote etc – no purchase is necessary. Personally, I’ve derived most of my affiliate income from promoting CPA offers. They convert pretty well since all the users have to do is take an action. Getting warm and targeted traffic (like from Google search) will do wonders to your conversion rates. To increase your conversion rates further, make the links contextual and appear as part of the site design. I usually avoid using banner ads to promote CPA offers. While it could work, it could clutter your site which results in lower conversion rates. I’ll write more about how to promote CPA offers in my future posts so, please remember to come back! One hurdle you’ll encounter when trying to join MaxBounty is that they will call you on the phone for an interview. But I think it’s worth giving it a try. With MaxBounty, you can choose to get paid weekly too which is good. Formerly known as Linkshare, Rakuten Marketing is another affiliate network offering a few big brands. You can find Walmart, Bloomingdale’s, Sephora and the likes here. It’s often voted as the best affiliate program for fashion and beauty bloggers. If you offer tutorials in your blog and want to promote relevant online courses from Udemy or Coursera, Rakuten can be an option. I’ve used them actively during their LinkShare days and they were great. Although I read recently that they have a less friendly user interface. Creative Market is an online marketplace for community-generated design assets. As an affiliate, you can promote WordPress themes, stock photography and other digital goods. Creative Market offers a flat 10% commission for every new customer who purchased through your links. That’s pretty low for digital products if you ask me. However, to make up for this, you will earn 10% on every other purchase the customer makes for an entire year. In addition, you can convert your affiliate earnings to credits which you can spend on Creative Market and cut down some of your business expenses. Envato Market is a collection of themed marketplaces for digital assets. You can buy anything from Photoshop actions, sound effects and video footage to WordPress themes and plugins. I’ve been an active buyer and used them for most of my online projects. So from a buyer’s perspective, they are pretty reliable. As an affiliate, you’ll earn 30% commission on any first purchase you refer with a cookie duration of 90 days. The minimum payout is $50. Anyone doing Internet marketing for any length of time should be familiar with ClickBank. ClickBank is a marketplace for digital products, from advice to getting in shape to healthy cooking recipes and dating advice. It’s one of the oldest and popular affiliate platforms online. One of the advantages of ClickBank is that anyone can sign up and create unique affiliate links quickly without the need for approval. Also, high commission, sometimes up to 75% is common. Their Gravity metric (sort of like the EPC) gives you a quick way to judge the performance and quality of a particular product. However, if you decide to join, be selective with which products you choose to promote to make sure they are of a good quality. Panthera Interactive is another network offering mostly CPA offers. I have had good experience with them. Unfortunately, my account was deactivated because of inactivity. Guess it’s time for me to reapply! VigLink is a little different from the other affiliate networks. It works by scanning your site for common product terms or merchant mentions and adds an affiliate link. While I haven’t tried them yet, I can see how this can appeal to a lot of bloggers. It allows you to monetize your content without having to apply to individual programs and insert the affiliate links manually. You may still need to apply individually to many merchants as getting accepted doesn’t mean you can promote all merchants in their network. Skimlinks specialises in in-text and contextual advertising. It works very similar to VigLink in that Skimlinks converts your outbound links to affiliate links. The main difference is that you have access to every single merchant’s program (over 27,000) from the get-go. Both VigLink and Skimlinks are good options in case you got rejected by Amazon associate program or if your blog topics are more diverse. If you don’t have an affiliate account with a particular merchant which you want to promote or don’t want to bother applying and setting up affiliate links, this may work for you. Fashion, hobbies, tech gear, discount and savings are topics that usually do well. With Skimlinks, you’ll get 75% of the revenue split. As a blogger, there are tools and resources which are necessary in order to run a blog. From web hosting to WordPress templates and from email marketing to social media scheduling tools. Chances are, they have an affiliate program that you can join and promote to your own audience. The following are some of the affiliate programs to consider. WP Engine – web hosting. Earn $200 per sale. ClickFunnels – sales funnels, landing page creator. Earn a 40% recurring commision. StudioPress – WordPress themes. Earn 35% per sale. Fiverr – hire a freelance. Earn up to $150 for each referral. Tailwind – the Pinterest scheduling tools. Earn 15% per sale and $0.50 per sign up. Grammarly – automated proofreader, spelling and grammar checker. Earn $20 per sale. PicMonkey – graphic templates, photo editing and more. Earn 30% per sale. WPforms – create contact forms, collect payments, opt-in forms etc. Earn 20% per sale. Social Warfare – plugin for social media sharing button. Earn 30% commission on sales. Sumo – Opt-in form plugins, sharing button, etc. Earn 30% recurring commissions. Ultimate Bundles – offers bundles for ebooks, ecourses and resources at a highly discounted price (90%-97%). Earn 40% commissions for every bundle you sell. The affiliate programs listed above are just a few of the more popular options for bloggers. But what if you want more option? Just head over to Google and enter “[niche/topic/product] affiliate program”. For example, suppose you are getting ready to create content for Christmas and want to monetize it with affiliate links. 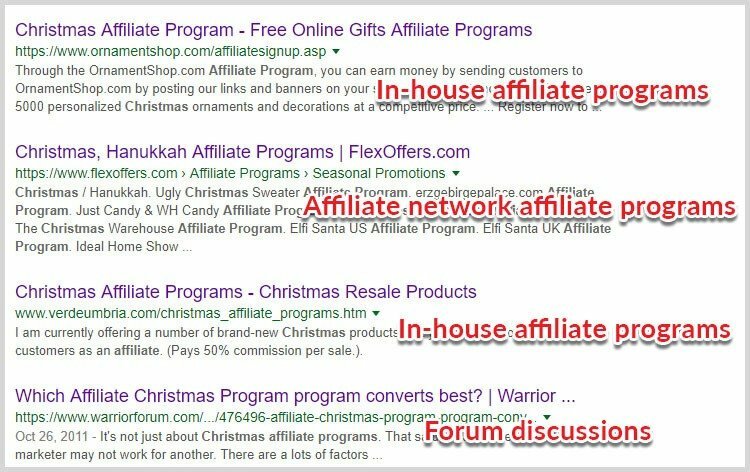 Go to Google and search for “Christmas affiliate program”. However, you may have to sift through the results as they can contain anything from related articles, affiliate programs listed on networks or specific products. Some bloggers and entrepreneurs also host affiliate programs for their own digital products, ebooks, online courses, coaching etc. One main advantage of joining these programs is the higher commission rates since they are mostly digital products and there’s no middleman to take a cut on. You can run your own affiliate programs too if you have your own products to offer. I’ll talk more about this in my future posts. If you don’t know what to promote or couldn’t find suitable affiliate offers for your blog, check what other successful bloggers in your niche are promoting. Sign-up for their email newsletters and see how they are weaving affiliate promotions in their emails. In addition, you’ll often have access to an affiliate manager after you joined a program. You can always ask him or her to find the best performing offers to promote. As I discovered more of the best affiliate programs for bloggers to join, I’ll update this post accordingly. So feel free to bookmark this page and come back later for updates. My hope is that this post will make it easier for you to find the affiliate programs or networks that are suited for your content, no matter what topics you write about. Are you already making money from affiliate programs? Which ones are your favourites? Excellent post. You filled in the blanks for a lot a questions I had on affiliate marketing. Glad to know Terrie. Thanks for reading! WOW! Amazing List! Thank you for posting this. I use several of these programs but you pointed out several I have not considered! I love how you broke everything down! You’re welcome Ashley. Glad you find the list useful! Thanks for publishing this. I have been looking for affiliate programs and brands outside of the usual Amazon program. You’re welcome John. Glad you find the post useful!